Steamboats refer to a variety of dishes eaten throughout East Asia, where ingredients are cooked in a simmering pot of broth at the table, usually communally, similar to a fondue. The name ‘Steamboat’ is almost exclusively used in Malaysia and Singapore. 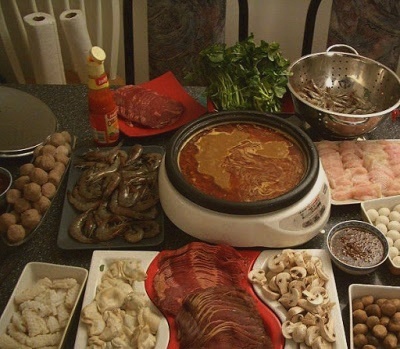 In other countries, ‘Hot Pot’ is the most common generic English-language term for this type of dish. Typical steamboat ingredients include thinly sliced meat, leafy vegetables, mushrooms, tofu, noodles or seafood. The cooked food is either eaten with a dipping sauce, or sometimes as a soup. Clean the squid by gently pulling head and tentacles away from the body. Pull out the clear backbone (quill) from inside the body and discard entrails. Cut tentacles from the head just below the eyes; discard head. Remove side wings and fine membrane from the body. Rinse body, tentacles and wings thoroughly and pat dry with kitchen paper. Cut the squid down the centre so that it will open out flat. Using a small, sharp knife, score shallow diagonal cuts in a criss-cross pattern on the inside surface. Cut scored squid into 5×2.5cm pieces and place in a bowl. To make the squid marinade, pound the chillies and salt into a rough paste with a pestle and mortar. Add the palm sugar, pound lightly, then stir in fish sauce, ginger and lime juice. Add the marinade to the squid in the bowl, cover and refrigerate for 2 hours. Place the chicken, beef, fish and prawns in separate bowls, then set aside. Prepare the garlic and ginger paste. Pound the garlic, ginger and salt together with a pestle and mortar until you have a rough paste. Divide this paste between the chicken and beef. Add the five lots of marinade ingredients for the chicken, beef, fish and prawns to their respective bowls. Thoroughly mix the contents of each bowl, then cover and refrigerate for 2 hours. To prepare the bamboo, cut the horn-shaped shoot in half lengthways, strip off the outer fibrous layers and then trim about 2cm off the base. Scrub, debeard, rinse and drain the mussels; set aside. Trim the ends from the choy sum, then cut crossways into 3 pieces and wash thoroughly; drain. Wash the asparagus and snap off the woody ends, then peel the lower part of the stem and cut into thirds on the diagonal. Discard the outer leaves of cabbage, then slice cabbage in half lengthways, remove core and cut crossways into about 4 pieces and wash thoroughly, pulling pieces apart to separate leaves. Wash the beansprouts, mint, Thai basil, coriander and Vietnamese mint thoroughly; drain well. Pick sprigs from the herbs. Bring a pan of salted water to the boil. Add in the Hokkien noodles and blanch until ‘al dente’, about 4 minutes. Drain, refresh in cold water, then thoroughly drain again. Bring a pan of water to the boil, add in the salted duck eggs and boil for 9 minutes. Drain, refresh in cold water, then peel and cut into quarters. Arrange the bamboo, mussels, scallops, choy sum, asparagus, cabbage, beansprouts, herbs, noodles, duck eggs, black cloud ear fungus, shiitake and Braised Dried Chinese Mushrooms in simple serving bowls. Place these on the table, along with the bowls of marinated meats and seafood. About an hour before your guests are due to arrive, make the stock. Place the water in a large electric wok, about 35cm in diameter. Add in the spring onions, garlic, ginger, galangal, lemon grass and sea salt and bring to the boil, then simmer, uncovered, for 20 minutes. Turn off heat, cover and set aside. Finally, arrange all the dipping sauces and condiments in small bowls on the table, allowing two bowls of each. When everyone is ready to sit down and eat, place the electric wok in the centre of the table. Reheat the stock and invite your guests to choose their own meat, fish and vegetables to cook in the simmering stock, before dipping them in their favourite sauces and condiments. Towards the end of the meal add the Hokkien noodles to the rich, full-flavoured stock. what a long list! i would rather go to the restourant. Lol! thank you for these tips. it helps. The steamboat is really tasty. My whole family enjoyed it. Thank you.